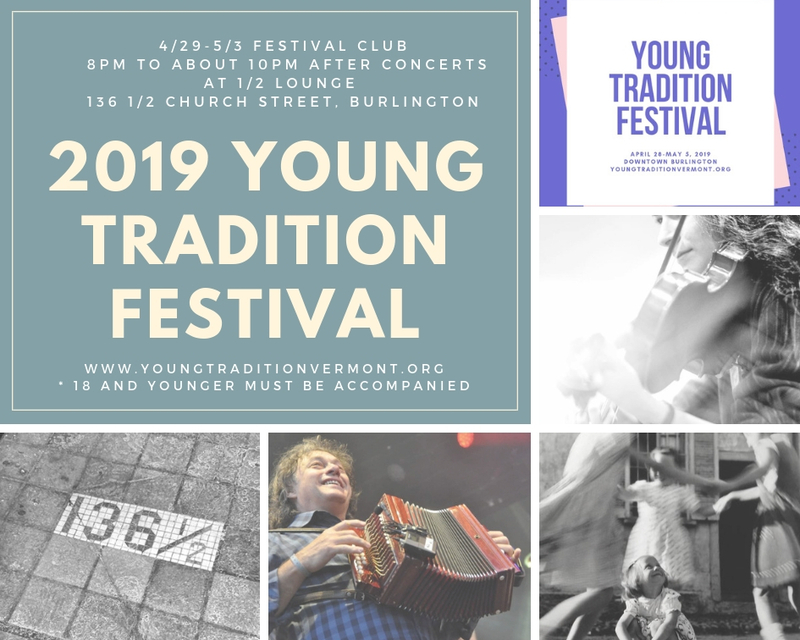 Part of the 2019 Young Tradition Vermont from April 29 through May 5. Festival ticket and reservation information TBA. More info from mark.sustic@gmail.com. Informal music session following evening concerts at the BCA Center across the street, starting around 8pm, finishing by 10pm. Minors need to be accompanied by an adult. Pete’s Posse is Vermont’s own trad-roots power trio! Composed of acclaimed musician Pete Sutherland, his talented protégé Oliver Scanlon and the uber-dynamic Tristan Henderson, Pete’s Posse never fails to surprise and excite! Twin fiddles in tight, wild harmony over high-powered guitar and pounding foot percussion with mandolin, clawhammer banjo, jaw harp, rocking keyboards, and soaring vocal harmonies adding color to the Posse’s sonic landscape. The Posse’s signature is variety: all multi-instrumentalists, the band plays a dynamic repertoire of folk-roots genres; songs and tunes, traditional and original. For over four years they’ve been bringing their brand of ‘Neo-Traditional Folk’ to festival stages, dance halls and concert series across the US, Canada and Europe. Pete Sutherland A warm voiced singer-songsmith and accomplished multi-instrumentalist, Pete is known equally for his potent originals and his intense recreations of age-old ballads and fiery fiddle tunes. The American Festival of Fiddle Tunes said Pete “covers the map and shines with a …pure spirit which infuses every bit of his music, and cannot fail to move all who hear him.” He has been on staff at dance and music camps coast to coast and is a widely known year-round teacher and performer at home. Sutherland is a veteran of many touring and recording groups including Metamora, Rhythm In Shoes, The Woodshed Allstars, Woods Tea Company, Ira Bernstein’s Ten Toe Percussion and is a founding member of the long running ‘contradance jamband’ The Clayfoot Strutters. He is also a producer with over 80 projects under his belt, and a prolific songwriter covered by the likes of Cathy Fink and Marcy Marxer, Jay Ungar and Molly Mason, Nightingale and Altan. Tristan Henderson Dynamic is certainly the word to use to describe Tristan! He played a variety of music genres before jumping into traditional music and is quickly becoming a sought after accompanist, session musician and performer. His unique ability to play any instrument with strings (and a few without) was set into motion when he picked up the guitar at the age of ten. An adventurous and powerful rhythm player who can also hold his own on melody, singing or picking, he never ceases to inspire with his boundless energy and joyful performances. Be prepared for a sonic immersion, as within his musical flair there are subtle (and not so subtle) nods to rock, jazz, funk, country and more! He was a 2013 winner of the Young Tradition Vermont talent contest with bagpiper Hazen Metro and in addition to Pete’s Posse he can be found performing anywhere else his diverse bag of tricks is desired. Oliver Scanlon A soulful multi-instrumentalist and spellbinding composer, Oliver began his journey of musical discovery playing the viola with the Vermont Youth Orchestra when he was nine. Shortly after he was introduced to his mentor Pete and the immense parallel universe of fiddle music! His keen interest in fiddling led him to seek out further learning and performing opportunities through Mark Sustic’s “Fiddleheads” program, and soon he began attending music camps where he studied various styles with Alan Jabbour, Kimberley Fraser, Andrea Beaton, Eric Favreau and other master fiddlers. In 2008, Oliver and few talented middle school friends formed a group, The Irregulars, a six piece outfit that has played scores of local dances and festivals, and took first prize in the 2011 Young Tradition Vermont talent contest! Then in 2013 he both co-founded the Posse and became the youngest member of Pete’s long running dance band The Clayfoot Strutters. He released his solo album “The Pond Jam” in 2014, which was both his senior project before graduating high school and a testament to his passion and artistry. Recognized not only for his mesmirizing playing, but also for being a meticulous sound tech, Oliver stays quite busy when not on the road with the Posse!